Preparing for the real world isn’t something that a typical eighth grader thinks about. After all, there are so many other day-to-day issues that take precedence, like determining what to do after school or deciding whether or not to post the latest selfie on Instagram. But South Middle School is flipping the conversation towards the future by presenting almost 300 eighth-grade students with the opportunity to plan for their careers. The recent JA In a Day Career Exploration program, sponsored and organized by Junior Achievement of Wisconsin, piloted curriculum that exposed students to a variety of business leaders and career opportunities available in the Chippewa Valley. Nearly 50 JA community volunteers and business professionals joined the students to discuss careers that are, or will be, in high demand once they graduate from high school. During the first half of the day, students moved from one planned session to another, gaining an understanding of how to prepare for the working world. The sessions focused on the skills and habits a student should practice in order to keep a newly acquired job. Additionally, an entrepreneurial panel consisting of business leaders and working professionals helped explain the importance of starting a business. 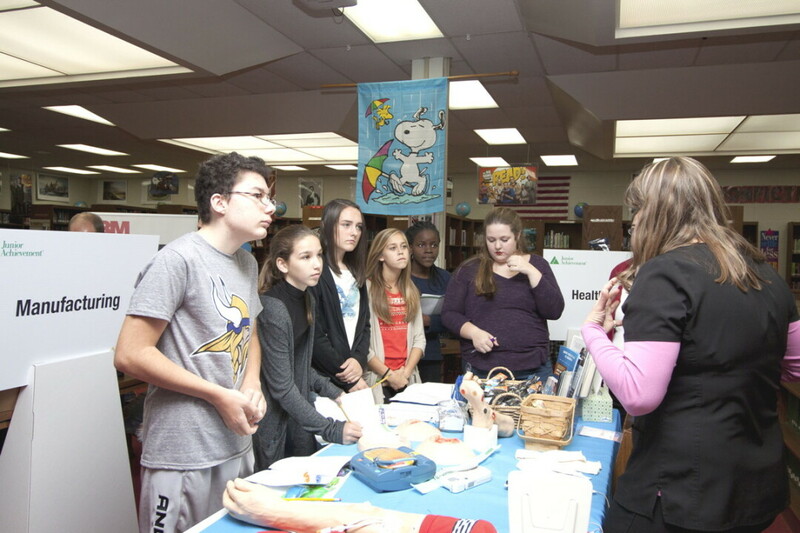 The school library was also transformed into a career expo center where students mixed and mingled with professionals to learn more about different elements of a job or a company. Career clusters were formed in the afternoon, allowing students to meet with various professionals in a small group setting. Students heard about the professionals’ career paths from high school to today. In many sessions, students asked questions about the education the professionals needed and the different jobs that prepared the professionals for the positions they currently held. During this session, students also met with individuals representing UW-Eau Claire and Chippewa Valley Technical College to learn more about career paths and college options available in the Chippewa Valley. “This partnership allows the students to learn from the volunteers’ experiences and ‘real-life’ examples of their individual paths they took from high school to the world of work,” said Susan Peterson, director of Junior Achievement. Junior Achievement hopes the JA in a Day Career Exploration program will be used by other local schools districts as a way to continuously strengthen its connections to the community in support of the students. To learn more about Junior Achievement, visit juniorachievement.org/web/ja-wisconsin.